Bon Appetit! The Sorbus® Utensil Caddy is ready to serve and display your everyday utensils, napkins, condiments, and more. 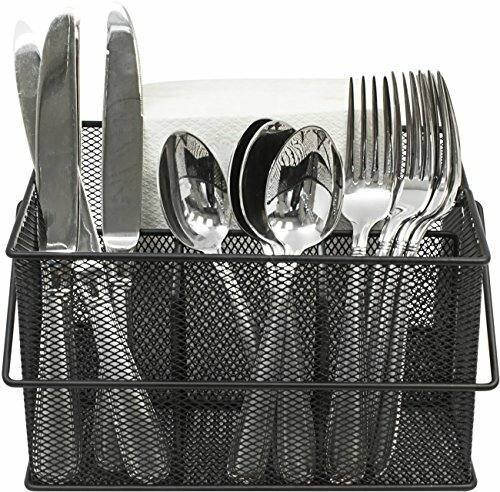 This attractive mesh flatware holder offers an alternative to cluttered silverware drawers and the perfect addition to your kitchen. It features one large and three small compartments with a handle to conveniently tote from place to place. Not to mention, this caddy is designed for multi-purpose use. Store office supplies, crafts, beauty products, toiletries, gadget accessories, coffee/tea/hot chocolate bags, and more. The possibilities are endless! Bring style and function to indoor/outdoor entertaining. Entertain in style with a utensil holder that complements any décor. Imagine how charming this tabletop accessory blends with crisp white dishes, lacy table linens, gingham checkerboard tablecloths, marble countertops, or paired with polished silverware. Mesh caddies are the perfect addition to your holiday table setting, buffet presentation, farm to table BBQ, and much more. Quickly transport utensils and napkins from the kitchen to the patio or incorporate during a tailgate party when football season is in full swing! During your next business meeting, enhance a coffee/tea display or pack these on your next camping trip for easy meal preparation. A clever and attractive design holds plenty and keeps items organized and within reach. Entertain large gatherings often? Add multiple caddies for additional convenience!